Van Le - Allen Bailey & Associates, Inc.
Van Le joined Allen Bailey & Associates, Inc. in October 2008 as a Consulting Actuary. She is an Associate of the Society of Actuaries and a Member of the American Academy of Actuaries. Prior to joining Allen Bailey & Associates, she served as an actuarial assistant for both North American Company of Life and Health and Manulife Financial. 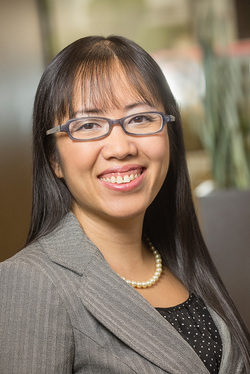 Ms. Le’s experience and involvement include: actuarial examinations, policy form and rate approval for regulatory agencies, RBC Phase I and II experience (Principles-based Approach to Required Capital), the development, pricing, and redesign of over 20 Life and Annuity products and riders, including Term Life, Universal Life, Indexed UL, Secondary Guaranteed UL, Survivorship UL, and Fixed and Variable Annuities. She also has experience performing stochastic testing using Asset/Liability model in TAS, providing hedging option cost reports for rate setting, developing Excel illustration systems for annuitization quote, including calculations for GMDB, GMID and other riders, preparing actuarial memorandums for product filings, developing product rates and parameters for illustration systems, providing risk assessment, as well as preparing reinsurance agreements. Van Le received her Bachelor of Science Degree in Actuarial Science and Computer Science from Ohio State University in 1999.